Chainsaws are dangerous machines that can cause an awful lot of damage if you are not protected properly. You should always try to find the best safety gear you can, so you can protect yourself from any accidents that might occur. Helmets will help to stop the blades penetrated your head and can lead to lesser severe incidents when worn. Even if you use a chainsaw for occasional use you should always wear a helmet because you never know when you might slip, or the chainsaw runs away with you. Take precaution very seriously when using chainsaws and always wear your protective gear, even if it’s only for a quick job. 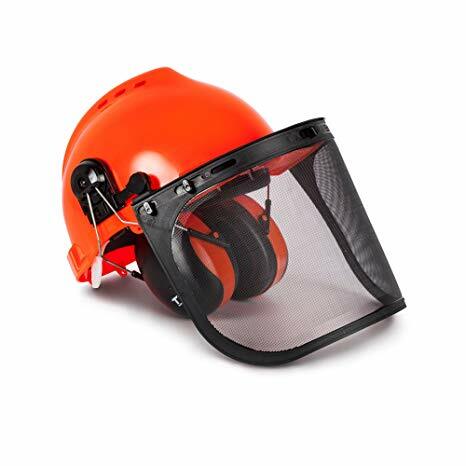 Not to mention the protection of your ears while using the power machinery and also the face guard which protects you from debris or splinters coming off the wood you are chopping. As well as aiming for a helmet that will protect you from the dangers of using a chainsaw or other dangerous machinery, a helmet could be the difference between having a severe trip to the hospital or you are able to continue with your work after an incident. There are many options for protective gear out on the market and so we are here to help you to choose. All helmet products from different manufacturers will have different qualities and we are going to go through them for you so you can make an executive decision based on your safety needs. This product is a “one size fits all” type which fits most sized heads. It works as a system and combines several parts into one whole system to guarantee your protection. It also includes a UV light protected hard hat, so the strong suns ray will not peel or reach through to the top of your head. It also has a six-point adjustable suspension system which is designed to absorb a shocking blow that could come from above your head. As well as this, it has hearing protectors which are used to absorb the sound of the chainsaw up to 25 decibels. While chainsaws are not typically the loudest machines out there, you will still benefit from the protection of your ears. The face screen keeps debris from flying into your eyes and face to stop them from penetrating the skin or causing damage. As well as the face screen, a metal mesh visor is included to add additional protection to your face. With its rain neck protector, it will keep you from getting water clogged if it begins to rain and so keeps the neck region clear of the water. The Husqvarna ProForest Chain Saw Helmet meets the ANSI Z89.1-2003 Glass G-E-C safety standards which means that you can be assured that it has been through rigorous testing and proven to give you the safety and security while working with a chainsaw. This helmet is a five in one protection system with the helmet, removable earmuff that can adjust, plastic visor and a mesh visor. It will work together with all of its systems to keep you protected while doing any job that requires a chainsaw. 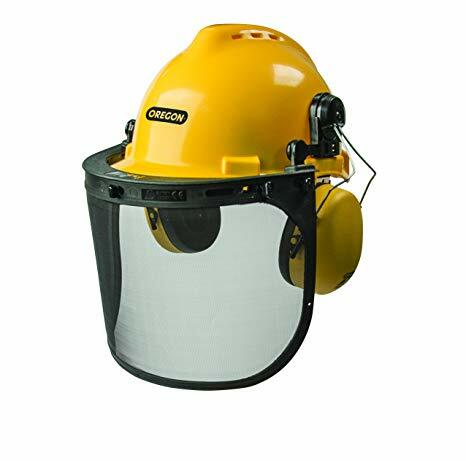 This helmet can be used while using any machine where your head might need protection from debris that might penetrate your head. It can adjust depending on the size of your head, so you can be comfortable. It can be adjusted up from twenty inches to twenty-four inches. This means it could be shared between crew members if needed. The two different visors can be changed depending on the wearer and the need for the job. The helmet’s visor has the advantage of not fogging up on rainy or cold days but there is the possibility of a splinter going through the mesh. The plastic one gives you full face protection but has the possibility of fogging up. It is also very lightweight and easy to transport so it will be comfortable to wear as well as travel between sites and jobs easily. This helmet also meets the safety requirements which are essential for chainsaw helmets from the ANSI and CE. All of the parts have been granted approval from these bodies. This means you can be assured that it has been tried and tested and proved its worth when protecting against debris and accidents with chainsaws. This helmet will protect you from all angles which is great as when using a chainsaw, you need to ensure splinters and debris, as well as the chainsaw itself, can’t penetrate any area of your head. It is made of an impact resistant material which also comes with 6 ventilation hole, making sure that your head can breathe while you work, and still retain strong protection. This helmet is very flexible which is only advanced by its six-point adjustment harness. This means it is easily adjustable in order to fit you well, so you are comfortable and protected. It also means it can be worn by different shaped and sized heads if you need to share this helmet. The visor is made of mesh and gives a wide face protection so that debris brought up by the chainsaw cannot penetrate your face. You can flip the mesh up when needed such as if you desire a clearer view of where you are working, and then you can flip it down when you resume your task. The earmuff is also adjustable and includes a consistent and optimum noise protection for your ears and hearing. The earmuff can reduce noise by a ratio of 22dB. This makes you much more comfortable while you’re working by reducing the noise by a considerable amount. It is also very lightweight and only weighs 2.2 lbs. This is very helpful as it can travel very well between sites and also be worn for long periods of time. It also meets lots of safety standards including ANSI Z89.1-2009 type 1, class E, G, and C.
This helmet is included in the wide range of safety products that come with this kit. These products will help to protect you from the harms of using a chainsaw. It is an Omega 2 helmet that is included in this package. The adjustment system is called Mega Ratchet which means you can use share this helmet amongst your crew. It meets the standards of ANSI Z89.1-2009 type, class C, E, and G. This is very important when using machinery like a chainsaw as you can be assured of the safety that the helmet with provide. 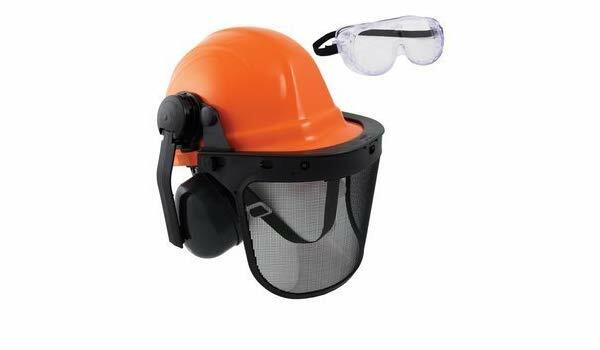 The steel mesh face protector helps to avoid debris flying from the chainsaw from penetrating your face. Even this steel mesh meets the ANSI Z87-S 1992 requirement for safety. The steel screen is also coated with epoxy which means it will not corrode or give you any glare while in use. The visor also has a resilient locking mechanism which means it can lock into three different positions depending on the type of job you need it for. It also includes ear muffs as well as sound shields which easily into the slots provided. These also meet the ANSI requirements of S3.19. You won’t have to worry about noise while you’re working when using these ear muffs while using the helmet. Goggles are also provided which have Polycarbonate lenses as well as vinyl frames which give it flexibility as well as a secure fit. It also has a comfortable strap which is made of durable elastic that allows you to have control of the helmet. This brand is one of the most famous in the machinery business and they have a wide range of items, including chainsaw helmets. This helmet has many built-in safety features including a full face shield as well as hearing protection. These products can be bought separately, but it comes in one overall package for convenience. This product is extremely lightweight in construction and while a chainsaw can be a heavy piece of equipment, but lighter protective wear can help to keep you comfortable. That is exactly why this helmet has sold protection against debris flying at you from your chainsaw but does not weigh you down while you work. The lightweight design of this helmet means that it can travel well, as well as being good for those who need it for home use. There is a six-point suspension which means it has comfortable support for you while you work. It also includes hearing protection to reduce the noise that reaches your ears while using your chainsaw. This helmet also meets the ANSI Type 1, Class C, E, and G standards. This helmet also has built-in ventilation which is a great feature when you are certain to work up a sweat sawing through logs, no matter what the climate is. Of course, it is necessary to wear a safety helmet, but it can extremely uncomfortable. 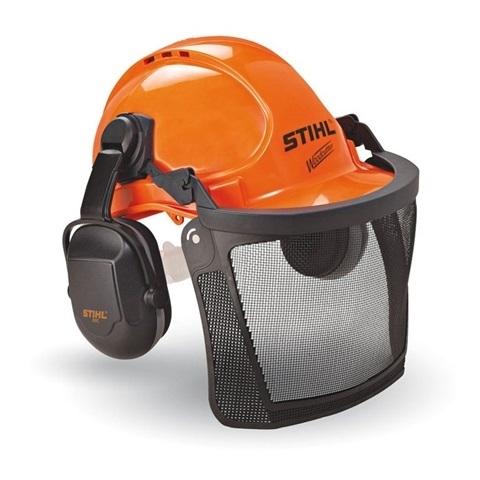 That is why this STIHL system has built-in ventilation that reduces the likelihood of becoming sweltering hot under the helmet which means you have a much more comfortable experience while working. You should pay attention to the helmet to plan on buying as it is a very important part of your protective gear. The helmet you purchase will keep you safe from debris flying from your chainsaw and stop it penetrating your face. Safety Standards Compliance — The safety standards that the helmet adheres to is an import thing to take notice of. It assures you that the helmet you choose has been tried and tested and proven to be safe to use. Keep in mind that the more stringent the standards are, the better the helmet is likely to perform. The most common standards are ANSI and CE which you should always make sure the helmet is compliant with. Comfort and Fit — You should make sure that the helmet you choose to buy is comfortable and does not fall or slip off easily. It is important to make sure the helmet has adjustable straps and the dimension of the helmet overall as this could help you to make sure it fits properly. Make sure a strap or dial knob is included so you can change the fit. Versatility and Breathability — It is an advantage if you can use the helmet you plan on purchasing for other tasks other than chainsawing. Versatile helmets can be used for a hedge trimmer, weed eaters and other jobs that require protection of the face. It might be a good idea to see if you can remove the parts and use them separately from the system. Breathability is also a good thing to look out for. Holes in the helmet help to circulate the air which means you are more comfortable, especially if it’s hot. The color of the Helmet — It is important to keep in mind visibility when working on a construction site or with other people as machines can be very dangerous. Orange or yellow helmets can be seen from far away even in dim lighting, while a white helmet will reflect the heat meaning you won’t get as hot as if your helmet was any other color. There are many benefits to wearing a chainsaw helmet, aside from the obvious. Safety is the most important thing when it comes to using the chainsaw as they can be extremely dangerous. Having protective gear on while using a chainsaw or any other dangerous machinery can reduce the likelihood of having a severe trip to the hospital. While other protective gear is an import, a helmet can increase the safety of your head, which is a major part of your body that needs protecting, as well as other things. All-Round Protection — Most helmets are all-in-one which includes attached ear muffs and attached visors which provides you with high-quality protection from all angles. Any debris or tree limbs could fall from anywhere while in this line of work but having an all-around protective helmet can prevent serious damage to your head or face. Protection against kickback — Sometimes the chainsaw can catch, and this means the bar can move towards the user very suddenly. A helmet will help to prevent serious injury once the chain brake is engaged. Without a helmet, even if the chain brake has been engaged, you would not stand a chance if the chainsaw came towards your face. Debris Protection — Helmets also provide protection from debris that can fly up towards the face at high-speed. Without the visors, you could be inflicted with long-term damage or loss of vision. Therefore, having a visor can provide much need protection against these potential threats. Several models have different visors, either mesh or plastic and sometimes both, and both have their benefits so make sure to do some research and consider what type of job you are doing. Protection Against Falling Limbs — Don’t forget that while working on trees or wood there is a possibility of a limb or tree falling and while you can provide the precautions necessary to try and prevent damage, having a helmet and ensure the protection each work will need. Most injuries in tree-work, such as concussion, skull fracturing or hemorrhage are most common in workers who do not wear a helmet. This is because the helmet absorbs the shock and energy of the impact by crimping the shell and then stretching the interior of the harness. This reduces the blow by a massive amount. Ear Protection — Internal injury is also a possibility when using machinery. Having ear muff attached can protect against the noise levels which exceed the levels that are safe to work in. The recommended exposure limit is 85 decibels but working with non-electric chainsaws is usually 115 decibels. The noise can lead to permanent hearing loss due to exposure to noise. In conclusion, a helmet is essential for those who plan on doing tasks that require a chainsaw. It provides protection and ease of use to make sure you are safeguarded against debris and other particles that might cause you to harm in this line of work. It is also advised to use a helmet when working in your garden at home to stop you from getting an injury. In this guide, we have provided five of the top helmets on the market from the top manufacturers to provide you with the safety you need. 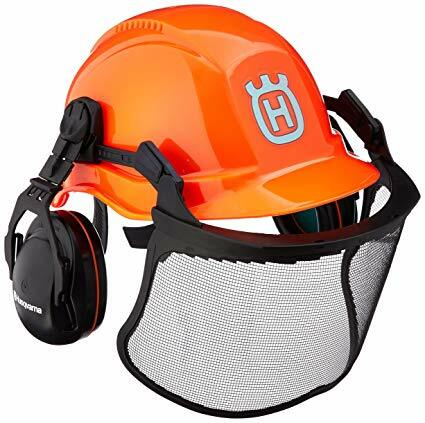 Whether you decided to go for the Husqvarna ProForest Chain Saw Helmet for its two face guards and comfortable protection or the STIHL Woodcutter Chainsaw Helmet for its ventilation system and affordability, we are sure you will be provided with the best protection for your chainsawing need. We have also walked you through the things you need to consider when trying to buy a helmet. These things need to be considered in order to purchase the best helmet for what you need and the job you need to do. Remember to keep in mind the safety standards so you can be assured of the protection you are getting, the fit of the product so you can be comfortable during work, breathability, and versatility so you can use the product on multiple jobs and make sure you do not over sweat, and finally the color of the helmet so you can remain visible to your team. We have also outlined the benefits of using a helmet aside from the obvious one where you will be protected from sustaining a serious injury to your head. Kickback can be a problem and you will need protection if your chainsaw decides to act this way. Your helmet will protect you from this as well as provide debris protect, protection against falling limbs, and ear protection. You should always be aware of what helmet you are buying and doing some research beforehand can help you to decide what is best for you. Either way, whatever helmet you choose, we are sure you will be happy with your purchase and will be able to protect yourself against any dangers while using a chainsaw. Hi, How effective are the Ear muffs on these helmets? The muffs that come with the helmet are the best you can get. There is no need to buy them separately. As we mentioned in the article they reduce the noise to a considerable and required amount. You can pick any one of the above, all of them have the same quality ear muffs. Thank you. Based on your review, I bought the STIHL Woodcutter Chainsaw Helmet. And I must say it is one of the best decision I made. Just wanna thank the editor. Cheers! Thank you. It means a lot to us. I’m thinking to buy Husqvarna helmet, but I am worried about the cons. Thoughts? Yeah, besides being a great helmet it has two cons as mentioned above, But the bees one shouldn’t worry you much and the first one is fixable. Yeah if you are too worried about those two cons, you can proceed with any other ones from above. Thank you.